This past Saturday, 1 November, kicked off World Vegan Month, which is celebrated across the globe throughout the month of November. The date marks the founding of the world’s first Vegan Society by Donald Watson in November 1944. Here in Geneva (and in other parts of Romandie), the association Pour L’Egalité Animale (For Animal Equality) has organized a full calendar of events to mark the occasion, beginning with a showing of the film Forks over Knives. I was already pretty familiar with The China Study and with T. Colin Campbell’s work in general, but I had never watched the film before, and so I jumped at the chance to see it. The viewing was held on the premises of Mu-Food, a wonderful little veggie (and almost completely vegan) café inside Dialogai, an association for the gay community in Geneva. 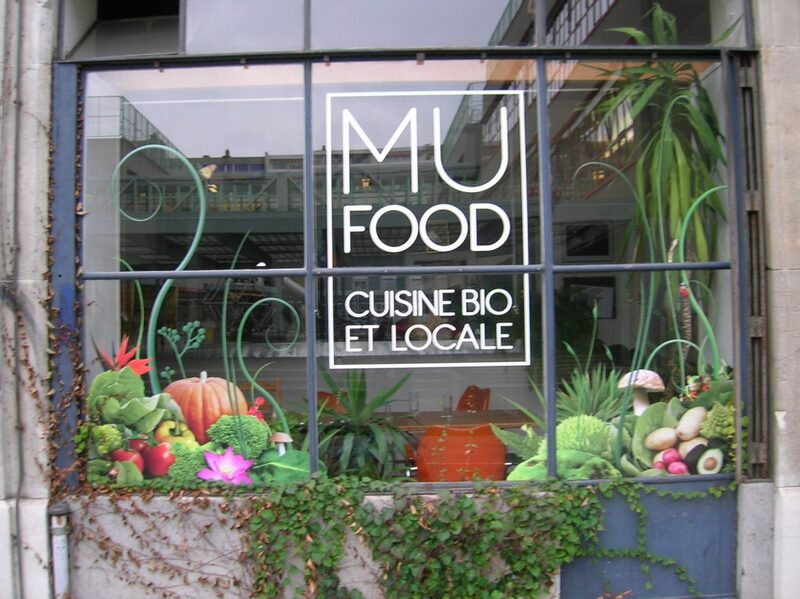 Mu-Food deserves a post of its own, which I hope to write one of these days. The viewing conditions, however, were, unfortunately, less than stellar. The organizers had some problems with the projector, the sound quality was terrible, and the film was shown dubbed into French without the promised English subtitles. My French is good enough that I could follow it anyway, but that was not the case for some of the other people in the audience. As for the content of the film, there was not much that was new to me, though it’s always good to have a refresher on these things. The basic premise of the documentary is that it uses the work of T. Colin Campbell and Caldwell Esselstyn to demonstrate that many of the degenerative diseases afflicting people in developed countries today, such as diabetes, osteoporosis, heart disease, high blood pressure and even cancer, are linked to the Western diet of processed and animal-based foods and can be prevented, controlled and even reversed by switching to a whole foods, plant-based diet. 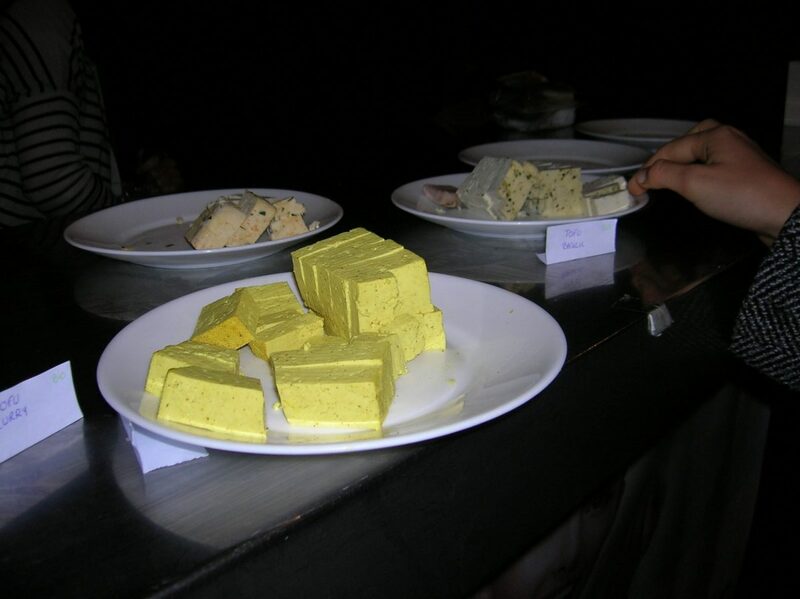 While I enjoyed the film (and the free tasting of local tofu made by Swissoja), the best part of the outing was meeting like-minded (and not so like-minded) people and hearing about their experiences and their different views on veganism. This might sound odd but, as far as I know, until Saturday I had never met another vegan before. That’s not to say that I felt isolated or alone in my food choices; by listening to Colleen Patrick-Goudreau read out letters or take calls from other listeners on her fabulous Food for Thought podcast I have heard plenty of other people’s stories of transformation, which really helps to validate my own thoughts, feelings and beliefs. Still, I do think there’s lots to be said for connecting with other vegans face to face, and this Saturday I took my first step towards integrating myself into the local vegan community here in Geneva. The people I met were a mix of vegetarians and vegans of all ages and walks of life. There was the young Austrian au pair who was struggling to maintain her vegan lifestyle while living with a French host family that ate animal products at every meal, and who confessed that sometimes she did have to eat dishes with small amounts of dairy in them. There was the raw foodist who answered a question about alternatives to cooking with oil by saying that we shouldn’t be cooking our food at all, because doing so destroys vital plant enzymes that aid in our digestion. Then there was the American lacto-ovo vegetarian who used to live on a dairy farm and was touting the virtues of what she called ahimsa (non-violent) milk. The basic premise as I understood it was that, on an ahimsa dairy farm, the human and non-human animals would live in peace and harmony and take care of each other. She claimed to have great respect and admiration for cows and referred to them as “our mother”. I replied by reminding her that the cow was actually her calf’s mother, and that the calf was the rightful recipient of the milk. Her response was that, in this utopian vision of hers, the calf would still get his or her share of the milk, as the cows produced enough to feed both their calves and humans. While I’m sure her heart was in the right place, I am also quite certain that the type of slaughter-free operation she envisioned could never be economically viable. It would simply be too costly to provide food, shelter, veterinary care, etc. to the dairy cows, the bulls who got them pregnant AND their calves for their entire lives, even when they were no longer “productive”. Freeganism is the practice of reclaiming and eating food that has been discarded. Freegans and freeganism are often seen as part of a wider “anti-consumerist” ideology, and freegans often employ a range of alternative living strategies based on limited participation in the conventional economy and minimal consumption of resources. Wikipedia goes on to say that freegans engage in practices including dumpster diving, plate scraping, wild foraging, gardening, theft, employee scams, and barter as alternatives to paying for food. While I don’t see myself engaging in most of these practices (though I would love to learn more about wild foraging), I can respect freegans’ disdain for our broken food system and the wider global economic paradigm and their choice to opt out of it. So, it turns out there is quite a vibrant and diverse vegetarian/vegan community here. While many of its members seem to have approaches to veganism that are very different from my own, I don’t see this as a bad thing. On the contrary, I am looking forward to attending more of the vegan month activities so that I can learn from, and perhaps be challenged by, my fellow vegans. Contrary to what the vegan police would have us believe, there is no single way to be vegan and no rule book that all vegans must follow. In my case and, I believe, in the case of anyone who chooses a vegan lifestyle out of compassion for our fellow animals, that choice comes from the heart. If we let our own moral values guide our daily choices, then we don’t need a rule book. If we let our hearts be our compass, we will never be led astray. Glad you met with other vegans, there are many in Geneva. Your article was very interesting, thank you. I have a vegan foodstall at the Sunday market in Plainpalais, Geneva. It’s called : Be Vegan. Make Peace. If you have time to come to the market, would be nice to meet you. Hi Ursula! Actually I have been to your stand once and loved your food! I’m so happy that you found my blog. I went back to Plainpalais last Sunday and the Sunday before that to pick up some Vegusto cheese, but I couldn’t find you. Were you there? Perhaps I was looking in the wrong place… Will you be there this weekend? Hope to see you soon!